Cara Delevingne graces the upcoming June issue of British Vogue. The spread was photographed by Steven Meisel, styled by Joe McKenna and features the model and actress in the style of a modern bride. Wearing a large, white, vintage-inspired hat by Noel Stewart, Delevingne sports orange-colored lips by make-up artist Pat McGrath. In the accompanying black and white editorial, Delevingne appears draped in white fabrics continuing the theme of modernity. Overall, it is the most avant-garde of bridal tributes in keeping with the approaching royal wedding of Meghan Markle and Prince Harry. The cover model also took the time to write about the subject of love: understanding of romance, gender concepts, and key milestones for her generation which no longer involve just going down the aisle. Delevingne has already graced 14 Vogue covers since 2012, five of which were British Vogue and two of the US edition. She will next be seen in the Amazon fantasy series “Carnival Row” alongside Orlando Bloom, scheduled to premiere in 2019. 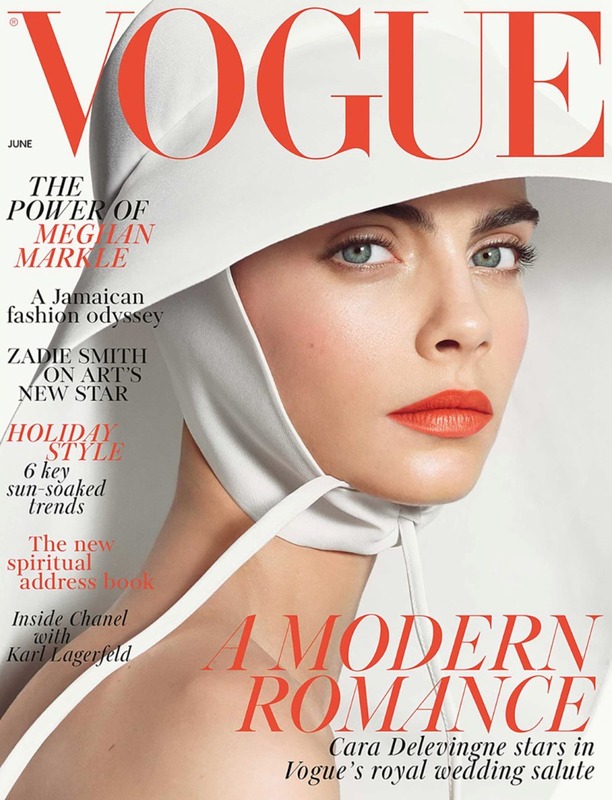 The June edition of British Vogue will be released on May 11th.